English: Large-frilled bowerbird, cabbage bird; French: Jardinier maculé; German: Fleckenlaubenvogel; Spanish: Capu-linero Moteado. physical characteristics 11.4 in (29 cm); female 0.27-0.36 lb (124-162 g), male 0.28-0.33 lb (125-150 g). Mottled brown with lilac bar across the back of the neck. Grassy avenue bowers are built beneath low bushes or shrubs, 3,300-6,600 ft (1,000-2,000 m) apart. Decorations (to 1,000 or more) include berries, seed pods, pebbles, bones, snail shells, and glass. Adult males emit infrequent, loud, far-carrying advertisement vocalizations of harsh churrings and other notes including vocal mimicry. 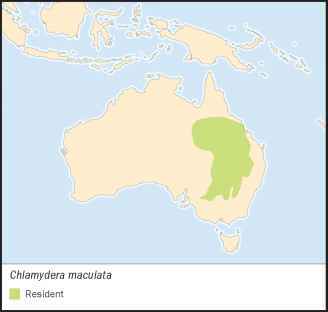 Polygynous, with promiscuous males and exclusively female nest attendance. Breeding occurs during July through March. Egg laying peaks in October through February. Typically places sparse open cup nest in trees and bushes at 10-40 ft (3-12 m) above ground. 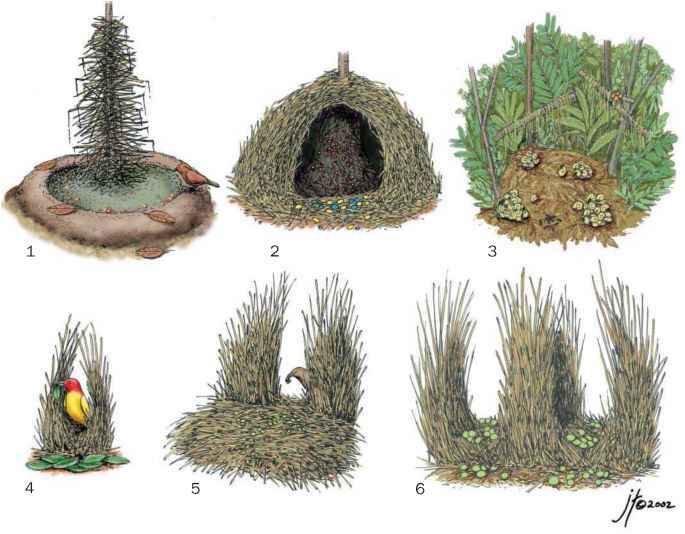 Nests are made of a loose bulky foundation of dead twigs and sticks and an egg-cup of fine twiglets, sometimes with dried grass stalks. Incubation period is unknown. Nestling period at one nest was 21 days.